Metal Wire Gauze Packing is characteristic of good low-load properties, large number of plates per meter in theory, and the number of plates will decrease with gas load increasing. The packing can meet the demand for accurate, large-scale, high vacuum distilling apparatus, and provide convenient conditions for distilling separation of some system difficult for separating, heat-variable system and high-purity products. 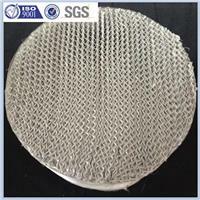 Metal Wire Gauze packing is available in a wide range of materials, include stainless steels, 304, 316, 316L, Carbonsteels. Aluminium, copper bronze etc. Further materials available on request. ◆ 250（AX） Precision rectification for high productive capacity and less theoretical plate number. ◆ 500（BX） Vacuum rectification for thermosensitive system and hard separation system, especially suitable for rectification with pressure lower than 7KPa . ◆ 700（CY） Separation of isotopic compound and isomeric compound.